No one likes being stuck at an airport during a long layover. You’re exhausted from the first leg of your trip and you know the pain isn’t over yet. You still have to drag yourself to a new terminal, board a new plane, and start the whole thing over again. There are only so many overpriced cups of coffee you can buy before you’re restless and ready to do just about anything else. Some airports have listened to you, traveling friends, and have decided to turn their airports into mini vacation spots. So the next time you’re planning a flight, consider the following airports to stop in for a few hours. Seoul Incheon Airport is globally famous for its features and attractions. You won’t have to worry about finding a place to sprawl here, you’ll be too busy checking out the in-airport ice rink or seeing a film at the resident cinema. If you’d rather learn a little bit about the country, you’re in luck. 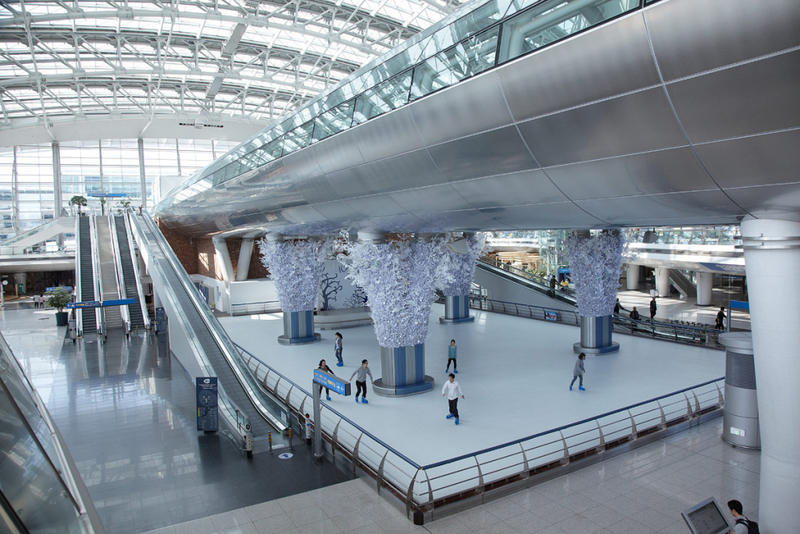 Incheon airport has a cultural center that offers plays, free city tours and local eats. If you’re too tired to enjoy any of these features, take a free shower and have a seat in one of their massage chairs. You can send dad golfing while you relax – also in terminal.